Mabel MacLeod - Frank Parlato Jr.
Linda Prugh is a long-time member of the Vedanta Society of Kansas City, Missouri USA, and author of Josephine MacLeod and Vivekananda's Mission, published by Sri Ramakrishna Math, Chennai. In 1999, Josephine MacLeod and Vivekananda 's Mission was published by Sri Ramakrishna Math, Chennai. I worked on that book for nine long years, discouraged from time to time by research that did not pan out, correspondence that led to a dead-end, and other obstacles. Much of the time, however, I felt very strongly that Swamiji was helping me, giving me mental nudges now and then, giving me new ideas or letting me know that particular passages in the manuscript needed to be checked. The experience of working on that project gave me much joy, but I often wondered if the book would ever be finished. I did not know what was in store for me. I did not know that as a result of the publication of that book, I would ultimately hold in my hand three artifacts of Swami Vivekananda, heretofore unpublished, in the form of two notes and an inscribed copy of the Bhagavad Gita. In March 2002, in honour of the centenary of Swami Vivekananda 's last days and his Mahasamadhi, I had just finished compiling a three-part article, which was to be published in the June, July, and August 2002 issues of Prabuddha Bharata. During that whole spring period I was deeply thinking of Swamiji, each day trying to envision what he must have been doing 100 years previously, what letters he was writing that spring, where he was, and how he was feeling generally in the final days before he gave up his physical body, July 4, 1902. It was just at this time, in April 2002, that two previously unknown photographs of Swamiji turned up in Hollywood. They were found in a box at the Vedanta Society of Southern California. Both photographs were published in the Society 's monthly bulletins and soon appeared in The Vedanta Kesari and Prabuddha Bharata. When I saw them, I thought to myself, Swamiji is still full of fun and in his playful way is reminding us that he will turn up in surprising ways, again and again. It was that same spring that he turned up for me in a surprising way. This is what happened. On a Sunday in April 2002, a woman named Hilary MacLeod Hammond Chandler attended a Service at the Vedanta Society of St. Louis. In the book sales display area she saw a copy of the book Josephine MacLeod and Vivekananda 's Mission. She bought the book and after the Service, when she was introduced to Swami Chetanananda, she told him she was related to Josephine MacLeod. The swami was happy to meet her and gave her my contact information. She wrote to me and put me in touch with two of her cousins, E. Rowley Elliston and his sister, Elizabeth Penn Elliston. It is indeed through the kindness of these three people that this article has been made possible. Through correspondence with Hilary Chandler, Rowley Elliston, and Elizabeth Elliston, I learned that their grandmother, Mabel MacLeod, had known Swami Vivekananda; that he had visited her home; and that in the family archives were two notes in his hand as well as a copy of the Bhagavad Gita, which he had given to Mabel and inscribed. In this article I will present what I believe to be the most probable time periods for Mabel MacLeod 's having met Vivekananda and for his having visited her home, and I will present details of these three heretofore unpublished artifacts of Swami Vivekananda. Mabel MacLeod is mentioned in the biography I wrote as Mabel, a cousin of Josephine MacLeod and her sister, Betty. Vivekananda mentioned Mabel by her first name in several letters which have been published, so it was obvious that he knew her, but I had no idea how well. Mabel 's father, Hugh MacLeod, was the brother of Joe and Betty 's father, David MacLeod. Hugh and David MacLeod 's grandparents had left their home in Scotland in the early 1800s and settled in Nova Scotia. They had five children, only three of whom survived. In 1842, both their parents having died by then, Hugh and David MacLeod had gone to live with their married sister, Janet Waithman, in Providence, Rhode Island. Hugh attended Tufts College in Boston and became a Congregationalist minister (now United Church of Christ). During the Civil War in America, he served as a chaplain. After the war, he had a ministry in Brentwood, New Hampshire. There he met and married one of his parishioners, Harriet Hill. They had six children, three of whom died at very young ages. Mabel was their youngest child. Hugh MacLeod had such a liberal theological point of view that Mabel later commented that if her father had known about it when he was young, he would have become a Unitarian minister. Hugh 's brother, David MacLeod, who was in the real estate business, married Mary Lennon in Mobile, Alabama. They had five children, all born in different cities, including Betty and Josephine. So Mabel MacLeod 's father was the uncle of Josephine and Betty MacLeod, and their father was Mabel 's uncle. Though Mabel, Joe, and Betty were first cousins, they were far apart in age. Betty was the oldest, born in 1852, Joe was born in 1858, and Mabel in 1870. Mabel was actually closer in age to Betty 's daughter by her first marriage, Alberta Sturges, who was born in 1877. The main thing that connected Betty, Josephine, and Mabel was a liberal outlook and an independent, spontaneous quality. It was Joe who once said, ' "The readiness is all " shall be put on my tombstone if I ever have one! I stumbled into a family that gave freedom! '1 It seems that Mabel could certainly have made the same statement. Generally speaking, in the 1800s in America, young women were simply not pushed forward by their parents, because people did not generally expect their daughters to need the ability to face many intellectual challenges. Today it seems a strange idea indeed, but it remains a fact that in that era many people had the notion that young women did not need much education, if any. After all, it was believed, a woman 's purpose in life was simply to find and marry a suitable husband, maintain a peaceful household, and raise fine children. Her happiness and sense of fulfilment would come as a result of knowing that she had contributed to the accomplishments of her husband and children. It was not uncommon for young girls in their teens to be taken out of school, if they were sent there at all. In Joe and Betty 's cases, we do not know much about their formal education, but it is obvious from the circumstances of their lives that they did not attend college. Rather, those two sisters educated themselves through reading and travel and meeting other people. Throughout her long life, Josephine MacLeod, with her warm, friendly nature, struck up friendships quickly and loved to learn something new from each person she met. As for formal education, by the time Joe and Betty would have been the right age for college, there were less than a dozen women 's institutions that offered higher education and only two coeducational colleges in this country. In 1875, Betty married William Sturges, who was in business for himself, and by 1879 they had two children. Joe, who lived with the Sturgeses, was suddenly involved in their fast-paced family life with frequent transAtlantic travel. They also lived abroad for periods of time. Hugh and Harriet MacLeod were progressive thinkers, and though it was contrary to the custom of the time, they wanted their daughter to be well-educated and independent. They sent Mabel to Harvard Annex, which happened to be very near their house. Referred to at that time as The Annex, its faculty consisted of Harvard professors. Mabel loved natural science and took all the courses offered in that field. In May 1894, Harvard Annex became Radcliffe College, and on June 26, 1894, Mabel MacLeod and twenty-one other young women were granted the Bachelor of Arts degree. During his first visit to the West, Vivekananda spent a great deal of time in the Boston-Cambridge area. It was in Boston that he actually gave his first public lectures in America, before the Parliament of Religions opened. In the spring of 1894 he spoke at Smith College in April and at Harvard and Radcliffe in May, which shows how liberal and progressive these old and esteemed institutions were from their beginning. (He later spoke again at Harvard in March 1896.) Mabel must have heard the swami speak when he came to Radcliffe, but we do not believe she actually met him at that time. In the summer of 1894, Vivekananda spent about two weeks giving talks and classes at the Greenacre Religious Conferences in Eliot, Maine. There an astonishing variety of religious teachers and thinkers were giving classes and talks. The founder of Greenacre, Sarah Farmer, characterized the religious conference by saying simply: 'We have no room for iconoclasts. Those are the only ones we bar. All others are welcome to come and express their views. All are listened to with respect and attention. '4 One of those teachers was the famous Dr. Edward Everett Hale, a Unitarian minister. Mabel MacLeod 's older sister, Gertrude, had been a student of Dr. Hale 's for some years before dying at a young age, so she probably was the one who introduced Mabel to Unitarian teachings. Mabel became active in Dr. Hale 's youth group, and it is possible that Mabel attended the Greenacre Conference that summer of 1894, following her graduation from Radcliffe. However, if Mabel did attend the Conference we do not believe she met Vivekananda. Following his days at Greenacre, Vivekananda went to Plymouth, Annisquam, and Cambridge, where he was Sara Bull 's guest until mid-October. Again in December 1894 he spent three weeks there. Thus, there were many occasions when Mabel would have been in the general vicinity of the swami. Still, we believe that Mabel had not yet formally met him. In the meantime, in New York City, Joe MacLeod and her sister Betty Sturges were about to end one exciting phase of their lives and enter an extremely unusual and spiritually-rewarding period. Betty 's husband, William, their children, Alberta and Hollister Sturges, and Joe MacLeod --all lived together in a beautiful brownstone townhouse. They sailed to Europe often because of William 's business, and had an apartment in Paris, a house in London, and a home in Scotland. Joe and Betty lived a life of relative ease, meeting new people, and going to lectures, concerts, and galleries wherever they happened to be. Alberta and Hollister spent most of their early years into their teens in European boarding schools. Then tragedy struck. William Sturges became involved in serious business troubles that put him in court. These problems were the result of his having trusted business associates as much as he knew they could trust him, and being let down by them. The strain of this terrible reversal was too much for him. He broke down and had to be taken to a sanatorium. He died in November 1894. Betty MacLeod Sturges was now a widow. Francis Leggett had a large apartment in New York City at the Renaissance, and for a time that spring of 1895, Joe and Betty were his guests. It is possible that Mabel MacLeod came to New York City and that they introduced her to the swami. However, we do not believe this to have been the case. Francis Leggett also owned an estate known as Ridgely in Stone Ridge, New York, 95 miles north of New York City, and he invited Vivekananda to spend the Easter holidays as his guest there in the spring of 1895. Joe, Betty, and the children, Hollister and Alberta, were also invited. Later, in June 1895, Francis Leggett invited the swami, the sisters and Betty 's children, to Camp Percy, his fishing lodge in New Hampshire. A cousin of Joe and Betty 's, Georgia Spence, was also in the party. There Frank and Betty announced that they would marry in September in Paris. They asked Swami Vivekananda to witness their wedding, and he agreed. Right after the Camp Percy visit, Swami Vivekananda went to Thousand Island Park in upstate New York where he spent the next seven weeks. Joe and Betty sailed to Paris to buy Betty 's wedding trousseau. Frank and Swami Vivekananda sailed to Paris in August. Betty and Francis Leggett were married on September 9, at which time Betty Sturges became Betty Leggett. We do not know if Mabel and her family attended the wedding in Paris. Immediately after the wedding, Vivekananda went to London, where he gave a series of talks all that fall. In October Joe went to London, attended the swami 's talks and persuaded Betty and Frank to change their honeymoon itinerary and come to London, too. The newly-married Leggetts returned to New York in November. Swami returned there in December. Joe remained in Europe to keep an eye on Alberta and Hollister who were back in their respective boarding schools. 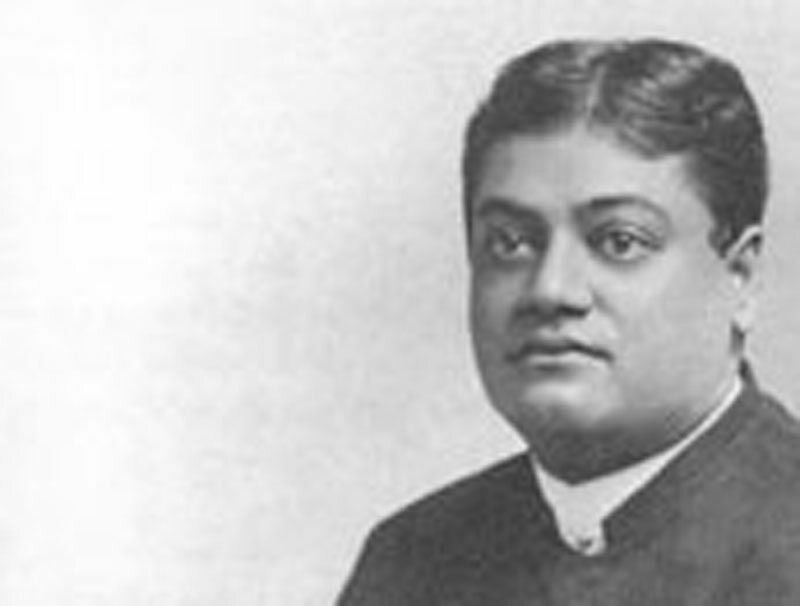 Vivekananda taught classes in New York City from December 1895 through the end of February 1896. We believe it was during this period that Mabel MacLeod met the swami for the first time. Some of Betty 's family had met Francis Leggett before she married him. However, it seems likely that since her wedding had taken place abroad, she would have wanted to follow the usual American custom of having a reception for family and friends when she and Francis returned to the States after the wedding. It is known that Swami Vivekananda spent the Christmas holidays at Ridgely with Frank and Betty. We believe it is highly likely that Mabel MacLeod and her family were also invited to Ridgely at that holiday time. For one thing, we know that Francis Leggett wrote a letter to Joe on January 6, 1896, telling her about the holiday visit of the swami. In that letter, written from his New York City apartment, he confided: 'One night at Ridgely we were all spellbound by [Vivekananda 's] eloquence --such thoughts I have never heard expressed by mortal man such as he uttered for two and a half hours. We were all deeply affected. '7 The fact that he twice uses the word all indicates that there were more than just the two Leggetts present. Another reason for believing that Mabel was present at Ridgely is the fact that her own daughter, Harriet, would later state that her mother [Mabel] had come to know Vivekananda through visiting the Leggetts at their country home in view of the Catskills [Ridgely]. Herewith I introduce to you a cousin of Mrs. Leggett 's Miss MacLeod of Cambridge. She is a very bright young lady. I want her to know you as she may get many a high inspiration of strength. She is a very pure & good girl. Prior to the spring of 1895, Swami Vivekananda had not known anyone named Leggett, and prior to September 1895 there had been no Mrs. Leggett, Betty being Betty Sturges until she married Francis Leggett in Paris. The fact that Swami Vivekananda had been in Boston and Cambridge in the spring and fall of 1894 but had not written a letter to Sara Bull introducing Mabel MacLeod shows that he had not yet met her. Obviously, since this was a letter of introduction, it was meant to be given by hand to Mabel, who could, upon her return to Cambridge, present it to Sara Bull. Mabel may have come to New York and met the swami for the first time in January, rather than at Ridgely in December. But we have a strong notion that Mabel went to Ridgely for the holidays and then went on to New York City. She could have been a guest of Francis and Betty Leggett 's in their New York apartment and attended the swami 's class talks at 228 West 39th Street. On the Friday morning of January 3, he gave a Karma Yoga class on 'Non-Attachment Is Complete Self-Abnegation '. That evening his Karma Yoga class topic was 'We Help Ourselves, Not the World '. On Saturday evening his Raja Yoga class topic was 'Psychic Prana '. Then on Sunday afternoon he spoke at Hardman Hall on 'The Claims of Religion: Its Truth and Utility '. In late March 1896 Swami Vivekananda went to Boston and Cambridge, where he spoke at Harvard for the second time on the evening of March 25. Betty and Frank Leggett also went to Cambridge at this time, staying as guests of Sara Bull. The swami also spoke five times at the Procopeia Club, once at the 20th Century Club, and twice to Harvard graduate students at Sara Bull 's home. A young man named John Pierce Fox was apparently corresponding secretary for the Graduate Philosophical Society of Harvard, for it had been his honour to issue, on behalf of the Society 's president, the invitation to Swami Vivekananda to speak at Harvard. John Fox had graduated from Harvard in 1894; had briefly attended the Harvard Divinity School, and in the spring of 1896 was acting as Sara Bull 's secretary. It was through a letter to John Fox that Vivekananda had accepted the invitation to speak. John Fox later helped prepare the published edition of 'The Vedanta Philosophy ', which was the talk Vivekananda gave to the Society. A reception was given for Swami Vivekananda in Sara Bull 's home on the evening of March 26. It seems very likely that since Betty and Frank Leggett were Sara Bull 's guests, that Mabel and her family would have been invited to attend this reception. John Fox, being Sara Bull 's secretary, would also have attended this reception. At some point, it is known that he met Mabel and became very fond of her. It has been my privilege to see this Bhagavad Gita, which is also carefully preserved in the family archives. Mohini Chatterji was well-known for his translation of the Bhagavad Gita. It was his translation of the Gita that had introduced Joe and Betty to Vedanta. Mr. Chatterji 's translation includes footnotes referring to Christian Bible verses that parallel the teachings of the Gita, so it had a strong appeal for many who had Christian backgrounds. Sara Bull knew him well, and had attended many of his classes on the Bhagavad Gita. She may have had copies of his Gita translation on hand. In mid December 1896 the swami returned to India, landing there in January 1897, and met by a stupendous outpouring of love and reverence from crowds of people wh erever he went. For much of the next year he travelled and tried to get rest in various cool hill stations. 'To Frankincense [Frank Leggett] and Joe Joe and Mabel my love, and so to you eternally. These were all blessings on these extremely fortunate people, all related by blood or marriage, and all related spiritually. The wedding of Mabel MacLeod to Franklin Tweed Hammond took place on October 7, 1897. Dr. Edward Everett Hale officiated at the ceremony. Franklin Hammond had been born in 1870. His father was a Unitarian minister who had become an attorney through apprenticeship. Judge Hammond served on the Massachusetts Supreme Court, and was awarded honorary law degrees by Tufts and Harvard. His son, Franklin, had graduated from Harvard in 1892, and from Harvard Law in 1895. Both he and Mabel loved music, he having played violin for many years and she being an accomplished pianist. It was when both were attending a concert of the Boston Symphony Orchestra that they had met. All their lives they would play violin and piano duets for an hour or two in the evening, sometimes joined by other musicians. Perhaps Mabel had heard the swami say about music, 'Music is the highest art and, to those who understand, is the highest worship. '15 Franklin Hammond practised law, was assistant district attorney for some years, and was later appointed a Massachusetts Superior Court judge. The Hammonds lived at 11 Scott Street, in Cambridge. Swami Vivekananda returned to the West in the summer of 1899. He spent ten glorious autumn weeks as the guest of the Leggetts at Ridgely. There were numerous friends and relatives who stayed for short or long visits during this period, and this would have been an ideal time for Mabel and Franklin Hammond to be part of the crowd that drank in the swami 's presence. However, Mabel was now pregnant, expecting her baby to arrive in late November, and we have the idea that in that era, she would not have hazarded the long and somewhat complicated journey from Cambridge to Stone Ridge, New York, in her condition. After his Ridgely visit, the swami spent three more weeks in New York. Sara Bull asked him to be her guest in Cambridge, but it is known that he did not accept that invitation. My blessings & congratulations on the new traveller _ May her path be always strewn with flowers. In June 1900 Swamiji returned to New York City. For several weeks he gave classes at the Vedanta Society of New York. It is known that he was invited to Newport, Rhode Island, by a devotee, and he may have gone there for a day or so on June 27. It is possible that Mabel and Franklin Hammond may have visited the swami in New York City that summer. He was in Detroit July 3-10, then in New York again July 11-26. He left for Paris on July 27. Since Franklin Hammond was just beginning his career, it is possible, but not likely, that the Hammonds went to Paris, where the Leggetts had a house that fall of 1900, and where they would have seen Swami Vivekananda for the last time. He left Paris in late October, toured Europe for some weeks, then returned to India in December 1900. He died on July 4, 1902. All their lives Mabel and Franklin Hammond welcomed and embraced non-traditional ideas, philosophies, and religions. Their first baby died of pneumonia before the age of two, but when the time came, they sent their second daughter, Harriet, to Radcliffe College, and their sons, Franklin and John, to Harvard. Rowley Elliston and Elizabeth Penn Elliston were the children of Harriet when she married, and Hilary Chandler was the daughter of John Hammond when he married. Mabel's grandchildren recall how their grandparents raised their children to respect and care for others --people, animals, and insects. Bees, wasps, and ants that made their way into the Hammond home were never killed, but rather carefully carried outdoors and released. Also passed down to the younger generations was an interest in and a respect for other cultures, other paths, and other peoples of the world. Thanksgiving dinner guests at the Hammond home typically included a number of international students with whom they had made friendships. We are most fortunate that Mabel MacLeod Hammond expressed to her children and her grandchildren how important her contact with Swamiji had been to her. Thus, these two letters and inscribed copy of the Bhagavad Gita have been lovingly preserved in the family archives for over 100 years now. And who knows in what other way, in what other city, in what other set of archives, Swamiji will show up to surprise us again and again! 1. Linda Prugh, Josephine MacLeod and Vivekananda 's Mission, (Chennai: Sri Ramakrishna Math, 1999), p. 23. [Hereafter, MacLeod and Vivekananda]. 2. The Complete Works of Swami Vivekananda (Kolkata: Advaita Ashrama, Mayavati Edition), 5:64. [Here after, Complete Works]. 3. Marie Louise Burke, Swami Vivekananda in the West: New Discoveries, 6 vols (Kolkata: Advaita Ashrama, 1984), 2:58. [Hereafter, New Discoveries]. 5. MacLeod and Vivekananda, p. 23, 30. 6. MacLeod and Vivekananda, p. 32. 7. Frances Leggett, Late and Soon: The TransAtlantic Story of a Marriage (Boston: Houghton Mifflin Co., 1968), pp. 101-02.